The war on Iraq has been most cruel to Iraqi children and it is important that the White House pay attention to this important fact. The likes of Powell, Rice, Bush, and Chaney have NOT made one single comment on the trauma imposed on the children of Iraq by so called Coalition Forces. We are still searching for weapons of mass destruction. War is the most horrible trauma one can impose on the children of any nation. I am old enough to have spoken to those who experienced it in World War II, the Korean War, the Vietnam War, various wars in South America and Africa, Desert Storm and Shield, Bosnia and so on. Our children are our precious gift to the world and often times no one wants to listen to them. In today's world large filthy rich corporations are making important decisions. The war on Iraq was made with large Oil and Construction Companies plotting the over throw of Saddam Hussein so that they could grab the OIL resources and make huge sums of money by constructing was they helped destroy in the first place. It is amazing that to date we have NOT found any weapons of mass destruction. Well, now they say they may all have been shipped to Syria. What we do not want to say is that many years ago WE the United States of America gave Iraq and Saddam all the weapons he needed to fight Iran. In fact Rumsfeld and Saddam had great talks and were good friends when it came to selling arms for gain. When Saddam used chemical warfare on the Iranian Armed Forced - we did not say a word. When Saddam killed thousands after Desert Storm and Shield - Shiites, men and women we instructed to rise against Saddam - we did not say a word. When thousands of Kurds were killed we the U.S. looked the other way. We always look the other way when it suits us fine. We do it at home with our Native Americans, steal their land and put them on land that on one wants. We call them RESERVATIONS! We do at home when we put millions of our African American brothers and sisters in jail. We do it when we do not give our American children education, health, and facilities we can afford but prefer to spend it on WAR! It is a shame when Adults never give a thought about children and how subtle they are to the exploits of war and war decision made by warmongers as those we witnessed day in and out on our Televisions. Of late the warmongers are silent and millions all over the world - have the worst disdain for those responsible for destruction of all human value in Iraq - especially the INNOCENT children. Today's warmongers are so focused on OIL and GREED they have no consideration for CIVILIZATION and CULTURE. They cannot respect innocent children and there lies their CORE understanding of this world and every day values. We have now so called leaders steeped in utter disdain for everything that the League of Nations and the United Nations put in place here in the United States. These leaders are creating a New World Order - Might is Right. These leaders have permitted innocent children to be killed. Parents to witness their children dying and suffering. They have permitted looters to exercise license and have shown the world that they have no sense of FREEDOM. Worst of all they have permitted the looting of museums so rich and ancient that the warmongers would take ages to be educated. In fact most of them are so steeped in being dumb they could not care less. Here is the United States some of them have created a PARANOIA - you have to look under you mattress to find check for a TERRORIST before you go to bed. We blamed the Anthrax Scare on the Terrorist; we blame the Washington Killings on the Terrorist. We blame anything we cannot find a good reason, which is negative on the so-called imaginary Terrorists. American Airlines going bankrupt on the Terrorists. If some one had killed some innocent children in the United States there would have been a hue and cry and utter condemnation of any party involved in the killing. How much of that have WE heard in recent days and weeks about the children of Iraq? And before that millions died because WE the United States forced the sanctions - depriving the children of Iraq medicine, food, and nutrition. It is not right to harm any CHILD. It is not right to harm any child in Iraq or any part of the world. It is especially not right to harm innocent infants who cannot defend themselves. It is horrible to bomb and kill the children and their parents by dropping huge 5000 lb. bombs - all in the name of killing and vendetta for a Dictator called Saddam Hussein! When will we ask ourselves when will we stop killing innocent children and people? Our leaders and especially those in Congress and the Senate saw that none of their daughters and sons went to fight the war in Iraq. Recent data shows that the son of only ONE SINGLE Congressperson sent his son to war! As I have been saying the powerful the rich and filthy with no conscience do not sent their off-spring to war - they prefer to impose that mandate on the sons and daughters of poor folks - common, everyday people who have more compassion then the CROOKS who make the killing decisions. Warmongers! 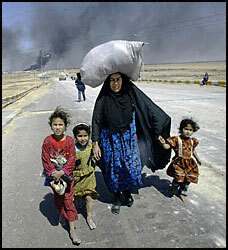 It is wrong to kill any Child and it a shame that we killed so many in the recent Iraq war.